Courtesy of KBay Properties, LLC. 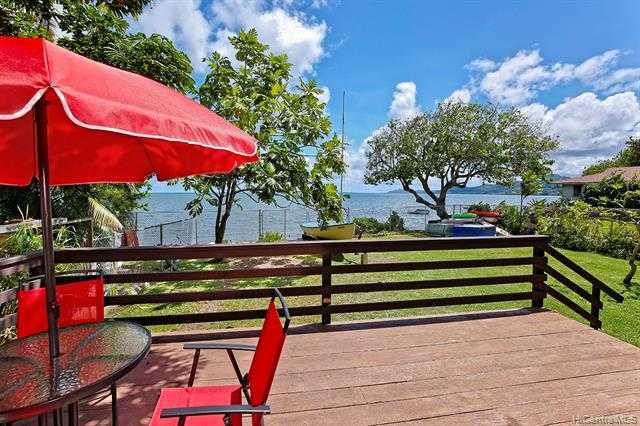 This is a tucked away Kaneohe Bay waterfront property that is setback more than 300ft from Kamehameha Highway with over 11,000sf of useable land available. Search these parameters on the Windward side for an oceanfront property and see the results. xD; xA;The property consists of a single family home currently that has three separate living areas, two of which generate rental income. If you are a buyer wishing to own on the Bay either as an investment or a home to develop into your specific dreams, here it is. xD; xA;There are less than a dozen waterfront properties in this area of the Bay. You are minutes to paddling, sailing or motoring to the Sandbar and enjoying all this reef-protected Bay has to offer. No high water wave action. Experience everchanging sunrises and moonlit nights. Please, send me more information on this property: MLS# 201831932 – $1,350,000 – 47-849 Kamehameha Highway, Kaneohe, HI 96744.